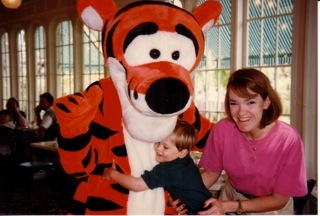 Disney Birthday Bash with Catherine West! In a few days my family and I will be headed to Disneyland to celebrate my sister's 8th grade graduation and my 20th birthday, which both occur on the same day! In honor of our upcoming vacation, I decided to do a Disney-themed bash this week, and our first guest is Catherine West! Catherine is the author of Yesterday's Tomorrow, a poignant and powerful love story set during the Vietnam War. Read on to find out more about this great author and to learn how you can win a copy of this great book! Catherine: That’s hard because there are so many great ones! I think I’ll have to say Beauty and the Beast. It was probably the first Disney movie that came out just as my daughter was getting to the age where she’d sit through a movie and understand it – I remember watching it with her and seeing how intent on it she was – and of course I’m a sucker for a great love story! Amber: Such a wonderful movie! Have you ever been to Disneyland or Disney World? If so, do you have a fun memory you could share with us about one of the rides/attractions? Catherine: My husband is a Disney Fanatic! Kind of makes sense considering he’s a pediatrician! We’ve been to Disneyworld five times! There is nothing like taking little kids to Disney – the first year we went, my son was three and my daughter five – I think that was the best trip ever. 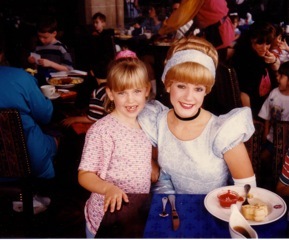 My favorite memory from that trip was eating breakfast in Cinderella’s Castle, and having Cinderella come talk to my daughter and tell her that she looked just like her!! I don’t think Sarah stopped smiling the whole trip! We thought my son might be a little young at the time, but it was amazing to see how much he really did enjoy it, once he got over the initial fear of the characters, he started following them all around! It truly is a magical place! Amber: That is so sweet! Sounds like you've had some memorable experiences at Disney World. =) Which Disney character from any of the Disney movies do you most identify with? Catherine: I’ve always loved Ariel from The Little Mermaid. She had a dream and she wasn’t afraid to go after it, risking everything for it. I think that as a writer, I really get that. And of course it all turned out well in the end for her!! Amber: That seems to be a prominent (and inspiring) theme in Disney movies--following your dreams! Have any of the Disney movies inspired your writing (ie: characters, plot, etc.) in any way? Catherine: I a m a die-hard romantic and I absolutely love happy endings, so I always appreciate the final scenes where we see our beautiful heroine in her wedding dress, snagging her handsome prince! I mean, come on, it doesn’t get any better than that! I can’t say off hand that any particular movie has inspired a book for me, but I love the concept of good overcoming evil. That’s important to me in my writing. Amber: *Sigh* I think the happy endings are great, too! What do you love the most about Disney movies? Catherine: I actually prefer the real people movies to cartoon characters, but I’m always amazed at how the cartoons manage to tug my heartstrings as well! I love that there is humor, a good moral premise and that they are made for all audiences. Of course over the years, Disney has come out with some not so great movies and some scary scenes that I wasn’t sure were entirely appropriate for my children, but on the whole I don’t think you can go wrong with a Disney movie. I do have to say that my very favorite watch over and over again Disney movie of late is Enchanted. They hit it out of the park in my opinion with that one. I love the music, the color, the story – everything!! So is it just me, or does everyone else want to know what’s up with the whole mother thing and Disney? Missing mothers, dead mothers, evil step-mothers…weird, huh? :0) Oh well, we love Disney anyway! Amber: Hahaha, I'm sure you're not the only one who's noted that! 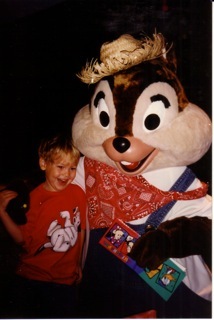 ;) Thanks so much for visiting with us today, and for sharing those adorable pictures from your past! Readers, if you would like a chance to win a copy of Yesterday's Tomorrow, just leave a comment for Catherine along with your e-mail address! A winner will be announced on Friday, June 3rd. And if you would like to learn more about Catherine and her work, check out her website and her blog. On Memorial Day we honor our fallen heroes--those men and women who served our country and gave the ultimate sacrifice for our freedom. This morning I will be at a local Memorial Day service, listening to my grandpa give a speech on the Merchant Marines. After his speech, my sister will be reading a poem written by a mariner who recently passed away, and I'll be singing "This is My Son" (by the bluegrass band, Cherryholmes). 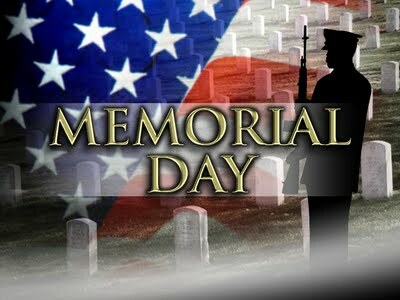 We are privileged to have a part in honoring the military this day. But let us also remember our military men and women who are still serving our country today, as well as those who have come home wounded. "…Where the spirit of the Lord is, there is freedom." This Wounded Warr ior Getaway (WWG) was at once the most intense and the most peaceful, from my perspective. Prior to everyone's arrival, there seemed to be a variety of attacks and "fiery darts" trying to derail the event in some form or fashion. But we started on time and the folks who were supposed to be there, came. Thirty-six volunteers from all over the country arrived to help – California to Florida, Illinois to Texas - and my husband and me from Tennessee. This was our third time to be blessed working in ministry side by side with these warriors and their families. As he says, "It's the highlight of our year." About 35 warrior families came, several with as many as five children!! Our keynote speakers were Clebe and Deanna McClary. (I had the privilege of meeting them last August, when a friend and I helped with the MARSOC Getaway in Myrtle Beach, SC.) They are one amazing couple with a phenomenal story and ministry, Clebe having won both the Silver Star and the Bronze Star. If you want to know more, check out their books. Great reads! How thankful we are that people like the McClarys put others first, showing their concern not only for physical healing but especially for spiritual healing. They truly exhibit the love of Christ, having been there, done that with Clebe's 30+ major surgeries and countless weeks of rehab after his severe injuries in Vietnam. Please remember them in prayer. Because God used them in such a powerful way, 4 people came to faith in Christ before Sunday morning, and 3 more during the Sunday service. Who knows since then, how many have thought about the eternal truths of God's perfect love that the McClarys shared? MANY thanks to those who sent thank you notes. (I was hoping there would be more because they are so meaningful. Maybe next time?! HINT HINT!!!) Books were sent, along with gift cards and some prizes for the BBQ and Saturday night event too. 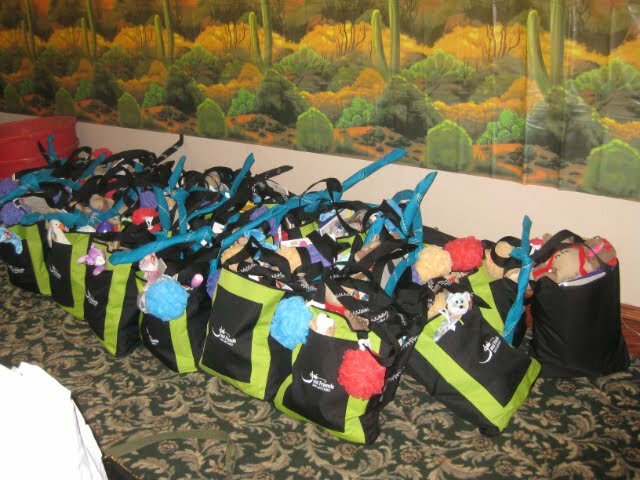 We fill welcome bags w ith these donated items to make the family's stay more enjoyable. Of course, there are also items for them to take back to their apartments or places they stay while their warrior is still in recovery. ** Think about this. It was the third time we saw some of the same families, which means their beloved warrior is still in treatment. This wears on relationships and the WWG serves as a time of refreshment for those who are weary. We had a western theme, which meant a lot of fun for all. Not only did we have a petting zoo (with pig, lamb, baby chicks and a statuesque Holstein with saddle for photo-taking), but we had a chuck wagon making biscuits and peach cobbler over the fire *YUM! *, a trick roping demonstration and a wonderful evening with Dr. Gene Howard, a dead-ringer for John Wayne. Things ran smoothly as we ministered to the families. Many had heard what a great weekend it is and were ready to get away from endless appointments and packed schedules so they could be a family for awhile. And oh the stories. One lady warrior thanked us repeatedly for making her middle child feel special. Six recommitted their lives to Christ. One senior was ready to go to her first ever prom Saturday evening. There was talk amongst the volunteers about who was good with hair and makeup. Deanna McClary (former pageant winner) to the rescue! We found some hot rollers and Ellen, our volunteer who always hosts the spa time, had lots of Mary Kay cosmetics and skin care for the pretty teen to enjoy. She started to bloom… By the time Cinderella left, she was stunning. The next morning she teared up and told us she never thought she could look so beautiful. Being a dog person, I had to meet Bosley. On the first occasion I sat on the floor enjoying his company and looked up at his master, a lady warrior. A chill ran through me as I recognized her from two previous WWG's. She has terrible PTSD, nightmares and she sleep-walks. When I said her name, she smiled broadly. Truly, I did not recognize her, she looked so fantastic! 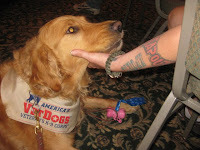 She shared how Bosley had changed her life. Her awesome dog has made all the difference. She is one of the people who came to faith in Christ this time. Your prayers are so important. Thank you! One young couple have been married three years. Not long after they married, he went to Iraq, survived a blast, and is now in a wheelchair. They've been having a very tough time, but after hearing the McClarys, they met with Deanna privately and told her they wanted what she and Clebe have. This couple both accepted the gift of salvation through faith alone in Christ alone Saturday evening. Watching them "dance" at the Saturday night event was one of the most memorable scenes for me. An older warrior made a point to see each volunteer and gave us a special commemorative coin from Iraq. He said the WWG had changed his life. That he was going to be a much better husband and father from now on, as he puts Christ back into the center of his home. These are random thoughts, but I trust it gives you a glimpse into this outstanding Grace ministry. As always, volunteers pay our own way. I hope you will co nsider volunteering yourself, and getting your own group involved. There is a tremendous need with so, so many young men and women returning wounded – which in turn has a devastating impact on the family. They've done their duty. It is our duty to be faithful and take care of them in recovery. 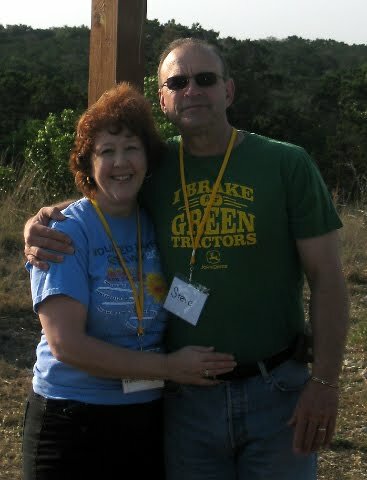 Please PRAY: For the Joni and Friends San Antonio staff, who do things with love and excellence, for the volunteers, and especially for the warriors and their families. And DO join us next time with your support, and hopefully your presence(! 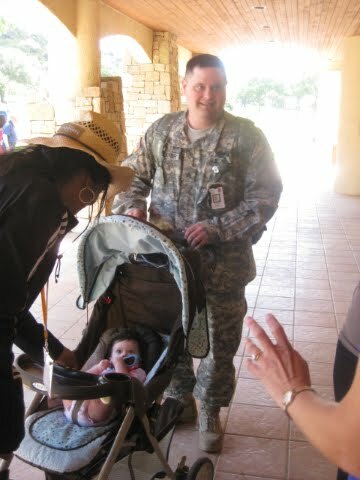 ), as we minister to our heroic American Warrior families. "She wants to change the world. 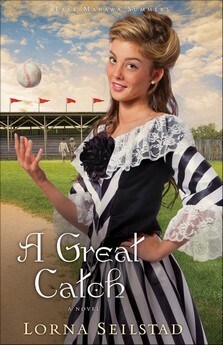 The perfect summer novel, A Great Catch will enchant you with its breezy setting and endearing characters." Once again Seilstad has swept me away to the sunny shores of Lake Manawa for a delicious summer treat! 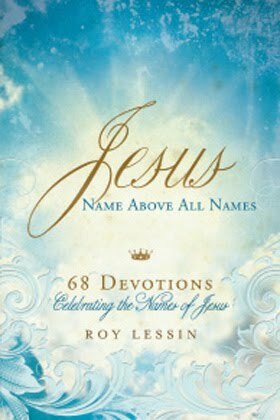 Following up the delightful Making Waves, this book offers another inning of fun and faith while sharing a unique and engaging story. The characters are both humorous and convicting as they stumble both literally and figuratively through the joys and trials of new love. Carter and Emily are simply adorable, but at the same time there is a depth to their story that causes the reader to pause and consider her own use or misuse of her time. There's a lot that demands our attention in this life, but there are consequences for every choice we make. It's a powerful lesson that's woven well throughout this sweet book. A Great Catch has a thoroughly enjoyable setting and a wonderful story--just right for the beginning of the summer season or anytime you're longing for some summer fun! 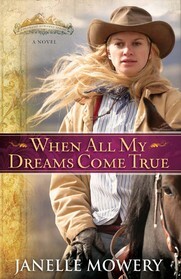 "Bobbie McIntyre dreams of running a ranch of her own. Raised without a mother and having spent most of her time around men, she knows more about wrangling than acting like a lady. The friendship of her new employer awakens a desire to learn more about presenting her feminine side, but ranch life keeps getting in the way. An adventurous novel of faith, hope, and love in the Wild West." With lots of action and a sweet romance, When All My Dreams Come True kept me from having many dreams as I stayed up very late in order to finish the book all in one night! From the opening chase scene to the various attempts on Jace's and Bobbie's lives, it was easy to speed through this book with all the stamina of a wild horse. Although the premise of this story, with a female wrangler hounded by danger and caught by love, is not as original nowadays, Mowery still manages a fresh take on this Western romance through great secondary characters and an action-packed plot. And the theme of trusting God with one's heart and dreams keeps the book unified and makes it an encouraging read. None of them will survive unscathed. Pleasure-seeking Romans find the seaside town of Pompeii the perfect getaway, and when the rich patrician Cato escapes Rome, intent on a life of leisure, he is unprepared for the hostility he encounters. For Ariella, disguised as a young boy and sold into a gladiator troupe, survival is her only ambition. But evil creeps through the streets of Pompeii and neither Ariella’s secret nor Cato’s evasion are safe. Political corruption, religious persecution and family peril threaten to destroy them, even before the mountain spews its fire. As Vesuvius churns with deadly intent, the two must bridge their differences to save the lives of those they love, before the fiery ash buries Pompeii, and leaves the city lost to the world." Like Vesuvius, this book is powerful and should not be underestimated! The tension builds steadily, with short sections from the volcano's point of view that remind the reader that below the surface of political upheaval and emotional drama stirs a dangerous depth that will drastically shift priorities once it explodes upon the scene. When that explosion happens, everything changes. Until then, different sorts of danger fill the pages--from an evil politician bent on continuing his unjust reign, to fears of inadequacy and failure, to intense gladiator fights. There's a lot to take in as a reader, and some of the events (both past and present) are heartbreaking and disturbing to read about. But through it all is an underlying message of hope and security through the Messiah even in the midst of all the evil and suffering of this life. The glimpses of community, acceptance, and love are very sweet indeed. The love story between Cato and Ariella is also quite an interesting one! I can't help but compare Ariella (Ari) to the Disney character of Mulan. Escaping from a horrible life satisfying the lust of a perverse man, Ari disguises herself as a man and joins a group of gladiators. She is a fighter through and through, and her spirit and perseverance catch the eye of Cato, who is a prominent, albeit new, citizen of Pompeii with a heart for those under oppression. Their journey is a difficult but necessary one that ultimately demonstrates where real, lasting strength and stamina come from: the Lord. And no section shows that truth more than the last part of the book, when Vesuvius finally fulfills her role. I admit to being rather fearful of volcanoes, especially since I saw the movie Dante's Peak when I was in middle school. Well, I made it through the conclusion of this book, and it is both gripping and moving! As I read it in the early morning hours, I ended up shedding a few tears. Pompeii: City on Fire is not a light-hearted read, nor is it an easy one, but it is a powerful one that attests to God's control in all things and the beauty of faith amidst the darkest storm. I hope everyone has had an enjoyable time at Camp Humility! I loved participating in this week's activities with all of you, as well as sitting around the campfire together, eating s'mores and discussing God's provision. It is a real blessing to know each one of you, and I'm glad Camp Humility gave us a chance to "get away" for a week! Congratulations, Michelle! Be on the look-out for my e-mail! To all of my campers, thank you for making this week so much fun and so memorable! As my official farewell, I put together a slide show/video like I did last year, except this one includes pictures from the Bald Hills area and Prarie Creek State Park in Northern California, many of which you'll recognize from earlier this week. The song is called "Faraway Land" by Ron Block, and I think the word fits so well for this retreat we've been on, focused on humility before our Lord. If it is the Lord's will, perhaps this will continue to be an annual event. In that case, I hope to see you next year at the Third Annual Camp Humility 2012! I have a tad bit more to finish on the flowers, and then I have to complete the two hummingbirds and do the back-stitch to outline the picture and put it all together. This is the back of the piece. Not quite as nice looking as the front, but I try to keep it somewhat clean like my grandma taught me! And this is what it will (hopefully) look like when I'm done! I love these kits, because I would be so lost without step-by-step instructions and the chart! The chart uses different symbols to color-code the project. (Don't worry--they also include a legend so that you know which symbol is which color!) I like to cross out the stitches I've done as I go so I can keep track of my progress. I love cross-stitching! Once you learn how to make the stitches, it's really pretty simple (at least for the more basic projects like I make), and it's so neat to see the picture coming together before your eyes! There's something special about counting out the stitches and poking the needle in and out of the fabric to make something beautiful, especially when you know who you're going to give it to! So, are any of you currently working on a craft? I'm passing around the marshmallows again so we can use them for s'mores or a topping to our mugs of hot chocolate. I even brought whipped cream and chocolate chips if anyone wants some! Last night we talked about hunger, and tonight I'd like to add a little bit to that discussion. "All who are spiritually hungry have been called to partake of the life of Jesus by faith. Jesus is God's manna to us. Like manna--the daily food God provided to the Israelites while they wandered in the wilderness--coming down from heaven, so Jesus comes to us from the Father. We don't need to store Him away and save Him for another day. He is ours every morning and He will sustain us throughout the day." That last part really caught my attention. I'm the kind of person that likes to save things for later. For example, I have books in my TBR stacks that have been there for a while (or will be there for a while) because I'm saving them, because I'd be so sad to get through my whole TBR stack and not have something to look forward to. As another example, at meals I usually like to save a bit or more of something I really enjoy (like a roll, as I'm a big bread fan!) for the end. But it's not that way with Jesus. We don't have to "store Him away and save Him for another day." We can have beautiful, satisfying experiences in His Presence every day! And because we can have a relationship with our everlasting Lord, we should never think of Him as something to objectify--He is God, and His love and provision have no end! So don't ever worry about running out of joy in God's Presence. We can trust that each morning He will be there, willing to bless His children with His care. God is so good! Today we have a special guest--my younger sister, Emily! She has been on countless horseback rides since she was four years old, and it is her lifelong dream to have her own horse. She is a very knowledgeable horsewoman, in my opinion, and today she's going to share some tips on horseback riding with us as we hit the trail! Amber: Before we get on the horses, what should we do/know to prepare ourselves? Emily: First tip: Always wear a helmet. Always wear cowboy boots when you go riding, because if you wear rubber boots or any other shoe your heel can slip through the stirrup, and you can fall off the horse and be dragged. I've heard a story about that! When you're riding make sure you don't have the reins past the horn of the saddle, otherwise it will cause your horse to stop when you don't want him to. When you're out riding, if your horse spooks, don't be frightened. The horses can sense fear, and they act really crazy! Instead, you should remain calm and soothe the horse. Make sure the stirrups are at an appropriate height for your legs, so that you have better control of the horse with your feet, and that way your feet won't slip out. Emily: Rocky terrain is not good for a horse, because a horse can stumble, and it would be messy. ;) In the desert would be fine, if you live near a desert. Forest is fun to ride in, and so is a meadow. It's not the best idea to ride horses on concrete. When you're trotting and running on concrete, you can't stop the horse, because if you pull back on the reins they would slip. Amber: What do you love most about horseback riding? Emily: Being with the horses! It's just fun being with the horses. Amber: And that's all she wrote (or said, in this case)! ;) Thank you, Emily, for joining us and letting me put you on the spot! Stay safe on those trails, everyone, and I'll see you back at camp tonight for our campfire! Go ahead and grab some s'mores fixings and gather around the fire, because tonight we're going to discuss hunger. "And when the tempter came to him, he said, If thou be the Son of God, command that these stones be made bread. But he [Jesus] answered and said, It is written, Man shall not live by bread alone, but by every word that proceedeth out of the mouth of God." "As newborn babes, desire the sincere milk of the word, that ye may grow thereby: if so be ye have tasted that the Lord is gracious." It takes time to prepare a good meal, and it takes time to be spiritually fed by God's word and through prayer. When you pour out your heart to God, there is a very real comfort and satisfaction that nothing and no one else can bring, because God is our Provider, our Friend, and our Lord. He is in control, and He cares about us. Yet how often I neglect this truth! "And thou shalt remember all the way which the Lord thy God led thee these forty years in the wilderness, to humble thee, and to prove thee, to know what was in thine heart, whether thou wouldest keep his commandments, or no. And he humbled thee, and suffered thee to hunger, and fed thee with manna, which thou knewest not, neither did thy fathers know; that he might make thee know that man doth not live by bread only, but by every word that proceedeth out of the mouth of the Lord doth man live." I think by seeing the context of the Scripture Jesus quoted, it seems that there is another element to Matthew 4:4, which is this: we are sustained by the very words of God, by His commands. God may give us food to live, but ultimately that shows it is His control that gives us our lives and the ability to live them. Sometimes, he suffers us to hunger. And sometimes he feeds us--something we take for granted. I do not claim to know what exactly Jesus meant when He quoted Deuteronomy 8:3, but I think that perhaps He was alluding to the power of His Father. He was trusting His life in His Father's hands, because at that time, while He was fully God, He was also fully human. And He submitted to His Father's will, whether that meant being fed or not. And thou say in thine heart, My power and the might of mine hand hath gotten me this wealth. But thou shalt remember the Lord thy God: for it is he that giveth thee power to get wealth, that he may establish his covenant which he sware unto thy fathers, as it is this day." And there it is--a connection between hunger and humility. When we are hungry (for love, for wealth, for success, for food, for hope, etc. ), will we trust that God truly seeks "to do thee good at thy latter end"? Will we believe that God chastens us because He loves us? Will we realize that He tries us because He wants us to grow? Will we remember and praise Him for what He has done when He provides for us? Today we're going to go on a hike through the redwoods at Prairie Creek State Park in Northern California. Bring your camera and let's hit the trail! The sunshine pouring across the ferns is framed by the majestic redwoods in this scene. Isn't is so peaceful here in the forest? The redwoods are such an amazing part of God's creation, and I'm blessed to be able to show them to you on this hike! I'm so strong--I can hold up that tree with my fingertips! Just kidding. ;) Any taller people want to try to reach the higher end? Across the way you can view the clearing. If you look closely, you can see stick-like things standing out above the grass. Those are elk antlers! Best to keep our distance as they rest in the sun. Before we head back to camp, anyone want to go to the gift shop? "An incredible reality about our earth is that it is rarely dark outside. 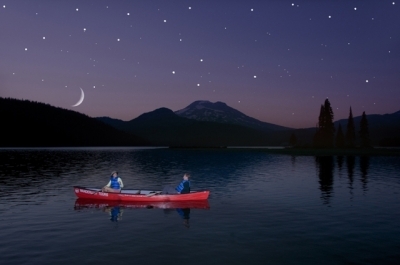 Even at night in the remoteness of the Cascade Range the stars punctuate the darkness providing nice illumination, particularly on a lake surface! Join our outstanding guides for a memorable evening of paddling, gazing for shooting stars and listening to the hush of the forest." Tonight let's see what it's like "to try and understand the serenity of a clear blue mountain lake." Let's discover how "the shadows from the starlight are softer than a lullaby." And let's find out why John Denver sang, "I know he'd be a poorer man if he never saw an eagle fly." Those are some amazing truths to contemplate as we look up at the glittering, distant, and numerous stars above! 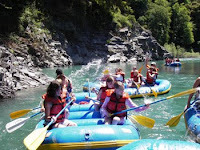 Grab your life vest, your paddle, and some sunscreen, 'cause we're heading out on the water to face the rapids head-on! If I remember correctly from last year, there were quite a few campers who didn't care much for rafting. If rapids don't quite thrill you, no worries--we're going canoeing tonight under the stars, which will be a lot less intense, but thrilling nonetheless! If you don't want to go rafting, perhaps you can all carpool to a spot downriver a ways where we can meet for a picnic lunch, complete with sandwiches, chips, watermelon, and maybe some leftover Laceys (cookies) from last night. For those of you who want to give rafting a try, I vote for electing Vince our guide! At the very least, we should get him to tell us some of his rafting stories! 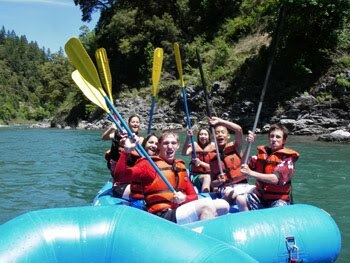 When I was in 8th grade, I went rafting with my class through Bigfoot Rafting Co. There was one pretty big and awesome rapid named Hell's Hole or something like that, but it was also commonly known as the Fuzzy Bunny, at least in our group. ;) So get a good grip on your T-handle on the paddle and lean back, because we're going in! It's a thrilling and crazy ride down these rapids, and you might get a little wet, but isn't it great? When we get to some calm spots we can maybe even play the trust game like we did last year, where we stand on the edges of the raft, link the T-handle of our paddles with the person across from us, and lean back. Just don't try this while we're actually in a rapid, though! You know, life can be so exciting, can't it? I find that I often have a poor attitude about daily circumstances, but perhaps if we approach life with a spirit of adventure we may realize that on the river of life God can build teamwork, promote trust, and provide a lot of fun and laughs along the way, even when we do get wet. ;) Something to keep in mind as we float along! Oooh, I think I see the rest of our group up ahead on the shore--with our lunch! So paddle hard and we'll all eat together. 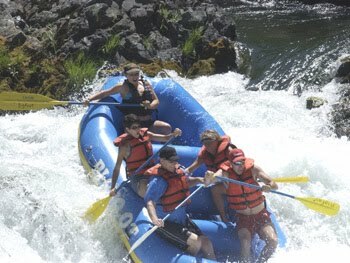 While we're eating, Vince and/or anyone else who's been rafting can share some of their stories with us! Then we can head back to the cabins, take a nap, and rest up before our nighttime canoe ride! The evening air is a bit nippy, so let's gather around the campfire. I've brought some s'mores fixings that we can pass around--plenty of marshmallows, graham crackers, and of course chocolate! Speaking of chocolate, I also thought I'd bring a few cookies. (Nobody's counting calories, right? 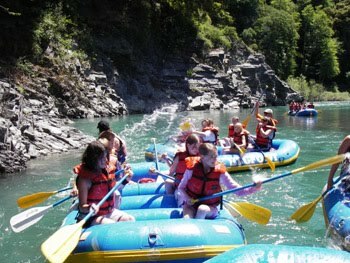 Besides, we'll be getting a good workout on the water tomorrow paddling in rafts and canoes!) 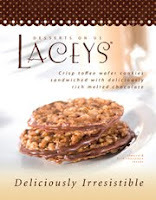 I recently tried some Laceys, which are "crunchy almond wafers sandwiched with velvety dark chocolate." Oh. my. goodness! I never thought I'd fall in love with them, especially because I'm so picky, but they are fabulous! And Michelle C., since it's your birthday today feel free to help yourself to as many cookies and s'mores as you want! ;) Anybody up for joining me in a rousing rendition of "Happy Birthday"? Now, last year at Camp Humility our first evening included a devotional on the Light, since we were spending time around the light of a campfire. I'd like to discuss light again tonight. It is said of Jesus in John 1:4-5 that "in him was life; and the life was the light of men. And the light shineth in darkness; and the darkness comprehended it not." Last night I finished reading Pompeii: City on Fire by T.L. Higley (you can read my review on Amazon.com). What a powerful read! And you know why it was so moving? Because it depicted the reality of the darkness of evil and suffering in the world, but it also depicted the light of a life secure in the Messiah--a light that seems incomprehensible as it shines brightly in the face of death and pain. It was a heartbreaking and frightening read (especially because I'm afraid of volcanoes), but it was beautiful because faith was not extinguished even when the earth spewed forth molten rocks, lava flowed, and evil tried (but failed) to take control. "God still guides seeking hearts to the one true Light. As the world around us grows darker, the light of Jesus Christ shines even brighter. He is the Light of truth, of hope, of purity, and of beauty. That Light shines through the faces of those who know Him, through the eyes of those who see Him, through the character of those who walk with Him, and through the hearts of those who love Him." As we watch the flames of this campfire, let us take a moment to remember that the Light we believe in will never fade, and the darkness of this world--the trials we go through, the pain we endure, the sorrow we face--will never be able to overcome that Light. In fact, we can see the Light more clearly when it shines in the darkness. And isn't a wonderful comfort and honor to know that God can use His followers to share that Light with others? Welcome to the Second Annual Camp Humility! Like last year, Camp Humility is more of a summer camp than the "roughing it"-style of camping. And as such, there is a full itinerary planned for this week so that all of us campers can learn more about each other, seek humility and faith together, and all in all just have a fun time celebrating the beginning of summer! For the returners, you will recognize several repeat activities, as well as a couple of new ones. However, all of the activities this week will be unique because it's a new year with new posts and possibly some new campers! Also, like last year there will be "campfire" posts each evening, except for the night we go canoeing. 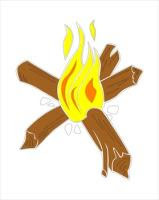 Our times around the campfire will involve either devotionals, discussions, or stories, and of course there will be virtual s'mores for everyone! ;) At the last campfire on Friday night I'll announce the giveaway winner. 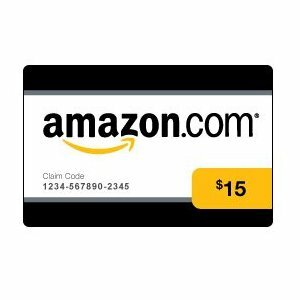 This year's giveaway is a $15 Amazon.com gift card! 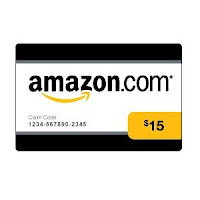 A gift card works well because I can e-mail it directly to the winner, and after camp the winner can buy a book, a movie, an MP3 CD, or maybe even a guide to camping! Sign up for camp in the comments section of this post! Just leave a comment saying you're joining camp this week. Please include your e-mail address! 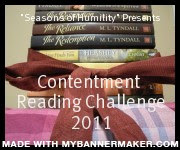 Extra Entry: Become a follower of this blog, "Seasons of Humility," or let me know if you already are a follower. Additional Extra Entries: Comment on this week's posts. One comment per post counts as an extra entry between now and Friday night--so you can get quite a few extra entries if you stop in regularly, since there will be about two posts per day! If you sign up for camp don't feel like you have to join in every activity--you're still qualified as a camper (ie: you're entered in the giveaway) if you just comment today. However, Camp Humility is only as fun as ya'll make it, and I'd love to have you participate as much as possible! See you tonight at the campfire! Last week my mom and I went off on the great lupine hunt, which has now become an annual summer tradition. There is a place about an hour from where we live where beautiful patches of lupines carpet the hillsides in the summer. I guess this year and last year my mom and I were a bit eager, because we went in May and the lupines weren't quite as numerous as we had hoped! 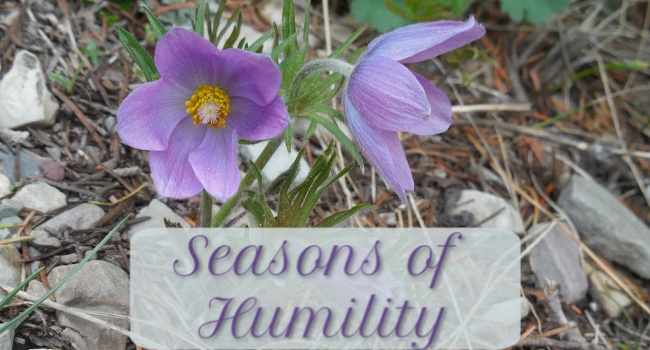 In the Seasons of Humility, summer represents a time in one's life when one is humbly following God and trusting in His guidance and purpose, through His grace. It is a season full of hope and joy. I want this literal summer's blog design to remind us of this "season of humility." 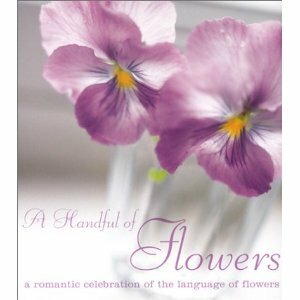 One book I have had for a while is called A Handful of Flowers by Cookie Lee. This book discusses the various meanings of flowers and is full of lovely pictures and poetry/quotes. The symbolic meaning of the lupine flower is "imagination," and it is listed under the category "Ambition & Success." How very fitting for summer! What I mean is that "imagination" is fitting both for the literal and symbolic summer. In the literal summer, all the colors of creation, all the vacation time in the sunshine, and all the reading (and writing, etc.) time is an open invitation to use our imaginations and to celebrate creativity--both God's creativity, as well as the creativity He has given us! May this season's blog design encourage you to use your imagination for God's glory and to praise Him for this mysterious, amazing life He has given us! In Jesus we can have hope for an eternal life with God that is beyond all imagination! Camp Humility Starts Next Week! Campfire: Winners and Our Story! So, will we have any returners to camp this year? If so, what did you enjoy most about last year's camp? This year we'll be participating in some old favorites, but there will also be some new activities, new prizes, and hopefully some new campers, too! ;) Can't wait to see you there bright and early Monday morning! I could start this post off with a lengthy description of how I'm failing this challenge so far, but I think that would be far from the contented attitude this challenge is supposed to foster. So let's just say I have every reason to be thankful when it comes to reading material, because my supply seems to be endless! ;) I haven't re-read any books since last month's update, and to be honest I'm not sure if I will by the time next month rolls around, as we're already halfway through this one. But sometime this summer I do hope to revisit some of my old friends! How are you doing on this challenge so far? Do you have any updates since April? Also, I think it would be fun if we could do another event for this challenge in July. Maybe another bookswap? Or perhaps we could combine last year's "Christmas in July" theme and do a mini re-reading challenge of some of our favorite Christmas books? Let me know what you would like to do! "When fate brings them together, they must choose between family ties and love. 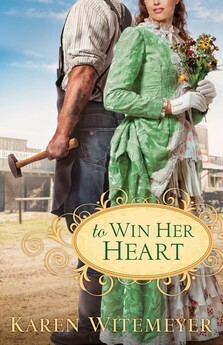 Against the beautiful and wild backdrop of the Rocky Mountains in 1878 comes this sweeping saga of romance, betrayal, and forgiveness from beloved author Kathleen Morgan." This book should come with a warning label: "Do not start reading at night. Will cause sleeplessness and book addiction." As you can probably guess, I started reading this book one night and got over halfway through before I finally went to sleep after 4 in the morning. A Heart Divided drew me in from the very beginning with the prologue, and after the first chapter I was hooked! With a stunning setting in the Rocky Mountains and characters that are unique, flawed, and fascinating, this book is a beautiful and mostly fast-paced read! The feuding of the mountain people reminds me a bit of Christy (the book by Catherine Marshall,which I haven't finished yet, as well as the T.V. series), and although it's a different mountain range, the mountain settings in both books are majestic. But what really kept me reading into the wee hours of the morning was the romance. 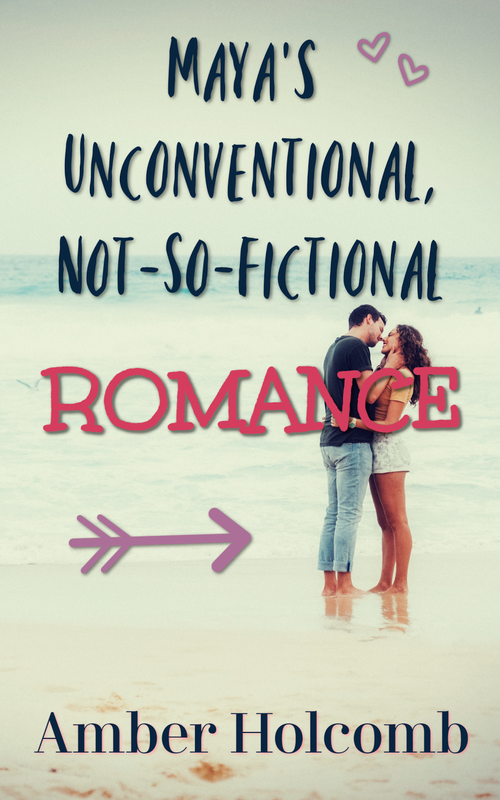 Sweet, exciting, and at times (especially the beginning) rather funny, the falling-in-love process is a pleasure to read about, although painful in some ways, too. And many of the secondary characters (like the hero's wise, handicapped brother; the heroine's adorable little brother; the kind housekeeper; and the understanding and charming sheriff) stole my heart, as well, with their protectiveness, endearments, and love. 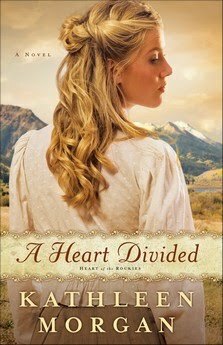 Add in a dramatic plot, touching scenes, and powerful lessons on forgiveness, and A Heart Divided is a book to fall in love with! It all started this past weekend. I read the California Driver Handbook online and took the practice tests. My parents helped me study, and then my mom took me to the DMV (Department of Motor Vehicles) on Monday. We walked up to the counter and were told that we would have a wait of one and a half to two hours. My mom looked to me, but as nervous as I was about learning how to drive, I was determined to take this important step that day if possible. So we waited. About an hour later my number was called. I walked to window 14 and went through the steps of handing in my paperwork, paying the fee, getting my picture taken, etc. And then I was handed the test. I went over to the testing area and answered the 36 questions amidst the screams of a rambunctious little girl and the continuous activity at the various windows, then headed back to window 14. The man ahead of me had a very interesting story, I must say! He was taking his vision test--but he only had one contact in. He went and got his glasses. However, to pass the vision test you have to read a line on the chart with both eyes, as well as with one eye covered, and then the other. The only problem was that the man could do two of the above with his glasses on, but because of his contact, he couldn't do all three. I love the question the lady behind the desk asked: "How do you drive?" He apparently had his reasons for only wearing one contact--thinking he only needed to take the written test, which would require close-up reading, not the vision test. He seemed to think that wearing only one contact is normal... Perhaps. Personally, I would hate only having one contact in, but I am really near-sighted, so who knows? If any of you have ever worn just one contact by choice, let me know! Anyway, when it was my turn, I handed my test in and waited, hoping I wouldn't miss more than 6 questions and have to take it again. As it was, I didn't miss any, and I now have my permit!! My mom took me out to lunch to celebrate, and then we headed to a big empty parking lot across the street from a fairgrounds. With great patience and kindness, my mom showed me the controls and taught me how to back up, drive around the light poles in the parking lot, and park the car. It was both scary and exhilarating, and I can still hardly believe I was actually behind the wheel of a car! Thank goodness no one else was in the parking lot, though. ;) It was a jerky ride, but we made it out safe and sound. I have a long way to go before I gain enough confidence to get on the road with other cars--and when that happens, I'll have to let ya'll know so you can stay off the sidewalks! ;) But in the meantime, God's in control and my parents are here to help me. Author Catherine West is hosting a special contest for Memorial Day (Monday, May 30th)! 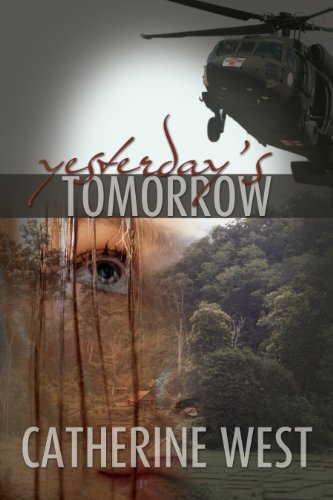 Her book, Yesterday's Tomorrow, takes place during the Vietnam War. It's a powerful, moving read! If you haven't yet read my review of this great book, click HERE to take a look. "...As long as we live in the reality of seeing men and women leave their families and loved ones for far off lands to do a job not many are willing to do, we need to honor them. We need to give them the highest respect and admiration. We need to embrace their families in our communities and pray for the safety of their soldiers. I would love to hear your stories - do you have a soldier in your family? Are you a Veteran or do you know one? Have you been affected by war in any way? If you can't say yes to those questions, write a short story that honors veterans. Fiction or poetry, whatever you like. Send m e your stories (do try to keep them short, we're not after the Pulitzer) and photographs too! I will publish them all on my blog and we'll vote for the winner. So if you want your story to win, you'll need to send people here to vote!! The winner will receive an autographed copy of Yesterday's Tomorrow, and something special from Bermuda! Can't wait to hear from you!" Click HERE to see the post on Catherine's blog. Click HERE to learn how you can contact Catherine and send her your entry. And don't forget to enter soon--Memorial Day is only 2 weeks away! 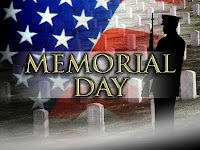 Let's honor our nation's heroes by sharing their stories this Memorial Day! "The odds are stacked against Bridget and Philippe reuniting. But God has a plan for them if they'll only believe. It’s 1687, in the burgeoning town of Philadelphia, and for seven years, Bridget Barrington has watched with growing affection as Philippe Clavell worked as an indentured servant for her father, a wealthy landowner. Her father rejects her request for Philippe to be a potential suitor as he has none of the qualities Mr. Barrington hoped for his daughter's future husband, the least of which is a respectable income. Heartbroken, Bridget accedes to her parents’ wishes and gets engaged to a man she does not love. However, Bridget's husband-to-be does not love her, but only her wealth. But there's always light in the midst of darkness for those who have faith. This stunning historical romance concludes the gripping Darkness to Light series." Bridget is a girl who knows her own heart. Unfortunately, she has a hard time getting the man she loves to accept it. Suffering from rejection, she is forced to accept the proposal of a man she doesn't love. Will Bridget and Philippe ever find a place where their hearts can be free? With an interesting plot and an admirable theme of various types of freedom, Where Hearts are Free is not a bad read. The inspiration from the author's own family history is very neat, and the setting is intriguing. That being said, it took me a long time to finally read all the way through this, and it was a struggle to finish it. I found there to be little unique about the heroine, and there weren't many qualities that endeared her to me. I liked the hero, especially at the beginning, but it seemed to me that he really didn't care much for the heroine other than as a member of his employer's family and a childhood friend. To have him become a complete romantic when his own thoughts don't even lend themselves to love is neither consistent nor realistic. All in all, this book has potential. Parsons' writing is enjoyable, just not overly ambitious. Since I have not read the first two books in the "Darkness to Light" series, perhaps Where Hearts are Free may be better accepted by those who have already become invested in the series. It's been an interesting week, with time travel fun and some unexpected Blogger issues. ;) But I hope you had a good time overall, and it is my great pleasure to announce that we have winners! To conclude this week, I'd love to hear about where/when you'd go if you could travel back in time! Let's face it--romantic time travel books and movies rock! (Hence, the reason for a themed week all about time travel...) And today it is my great pleasure to feature author Michelle Griep, whose time travel book, Gallimore, won me over a couple of years ago with a crazy cool plot and a crazy but ultimately charming, swoon-worthy knight!! I don't have an interview with Michelle to share with you today (although I'm hoping to set one up in the future! ), but I simply have to talk about her books anyway! 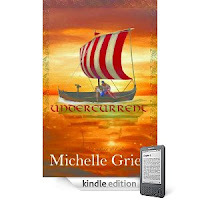 And if you stick with me for a discussion about knights and vikings, you'll have a chance to win a Kindle e-book of either Gallimore or her latest release Undercurrent! "Jessica Neale turns her back on everyone the day her husband dies. After conceding to a vacation in England, a bizarre storm and near-fatal accident alters her reality, and she finds herself in the past. When confronted by a knight bearing the mirror-image of her apathetic heart, it's a rude awakening to what she's allowed herself to become. Colwyn Haukswyrth, as cold and unfeeling as the armor he wears, is a knight who has one focus in life-himself. The product of a family rooted in hatred and greed, he never understood the significance of forgiveness. Until he meets Jessica Neale. More vexing and irksome than any wench he's ever encountered, this provoking bit of a woman teaches him what genuine love is—a lesson he'll take with him to the grave." I started Gallimore on a Saturday afternoon, and I finished it the following morning/afternoon. I simply could NOT put the book down! 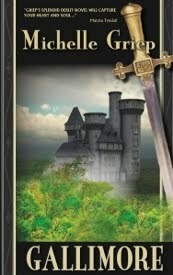 I was completely drawn into Jessica's story, from a topsy-turvy European vacation to a medieval land where she comes across the most arrogant, frustrating, and ultimately wonderful knight you'll ever meet! ;) *Sigh* The story is well-rounded, exciting, and just plain fun to read! "Professor Cassie Larson leads a life her undergrad students hope to attain, until she tumbles into the North Sea and is sucked down into a swirling vortex…and a different century. Alarik, son of a Viking chieftain, is blamed for a murder he didn't commit—or did he? He can't remember. On the run, saving a half-drowned foreign woman wasn't in his plan. Ragnar is a converted pagan shunned by many but determined to prove his Cousin Alarik's innocence. He didn't count on falling in love with Cassie or the deadly presence of evil that threatens his village in Alarik's absence." *Blissful sigh* My copy of Undercurrent can't get here soon enough!! If you want to read my review, it will hopefully be going up on The Borrowed Book blog sometime in the not too distant future! To enter, leave a comment sharing your thoughts about knights, vikings, Michelle's books, time travel, or whatever! Please leave your e-mail address so I can contact if you win! 1 Extra Entry: Be a follower of this blog (through GFC, e-mail, etc.). 1 Extra Entry: Be a follower of the group blog I contribute to: The Borrowed Book. 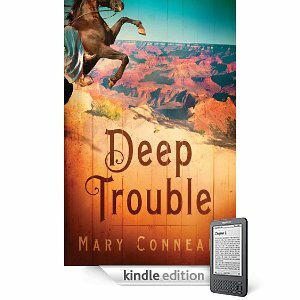 Please note: Your comment today can also count for Sunday's Kindle book giveaway (Deep Trouble by Mary Connealy). However, the only extra entries for today's giveaways are the ones stated above, NOT leaving comments on the other posts. I hope that makes sense! Yay for knights and vikings! "Who says a woman can’t keep a secret? When newspaperman Joshua Crawford comes to town searching for the man who sullied the good name of his grandfather, Daphne finds herself at a crossroads, reassessing the power of her words, re-thinking how best to honor her gifts, and reconsidering what she wants out of life." 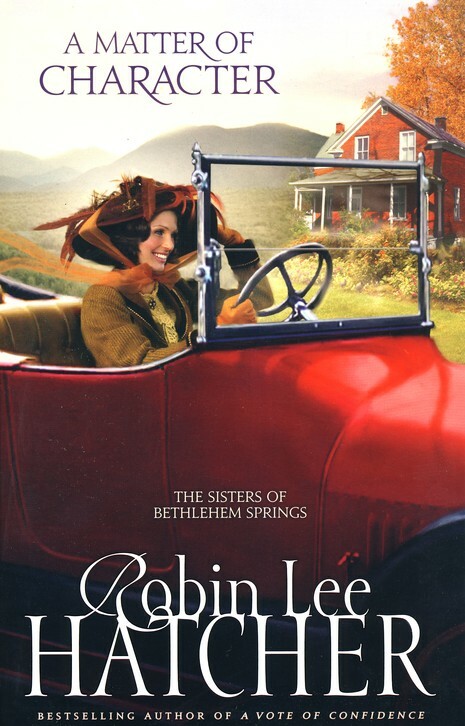 A Matter of Character is a sweet, fun, and meaningful conclusion to "The Sisters of Bethlehem Springs" series. As much as I loved Fit to Be Tied (the second book in the series), I think this one just might be my favorite! With a very relatable heroine, a conflicted hero to make your tummy flutter, and some interesting plot twists, this book turned out to be a quick and satisfying read. Hatcher is very adept at her craft, as shown by the fluidity of her words and scenes. Plus, I just love how the title was explored as a theme throughout the book, looking at what character really is and what it means to live out a godly character. As the heroine is a novelist/writer, I found that some of her internal struggles were ones I could understand, especially the question as to whether one should write for pure entertainment or to convey the truth. Very enjoyable book! Note: Most of this review first appeared on a post for The Borrowed Book blog. Happy National Train Day 2011!